“Rejoice! The Rocky Horror Picture Show now has a true, if illegitimate, heir!" 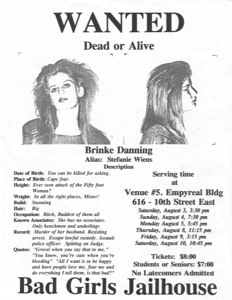 One of the critics liked Bad Girls Jailhouse so much he went on to design the posters for the debut of the UNCUT version of the play in 1996 (see one example to the right). A crooked warden, sadistic guards, bloodthirsty convicts, and one innocent woman clash behind bars in a white hot story of violence, revenge, and singing and dancing. 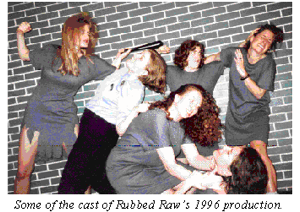 Yes, it's a musical spoof of women's prison films! or a copy of the play, click here. Angus Kohm's heartwarming story of an innocent woman's adventures in the big house. Featuring a strip search, a riot, and a shower scene - all set to music(! )- it is surely only a matter of time before this play wins a major award for it's contributions to society. Above is one of five wanted posters designed by D.G. Valdron. To see more click here.